Extraordinarily well-written…well-balanced in topics and current with the latest research…for the novice and expert alike…a phascinating journey through the world’s most interesting biology. Friends. Two virions of a myovirus courtesy of Jochen Klumpp. Creation of Thinking Like a Phage was the work of several hands. The book was first imagined, and then subsequently written, by Merry Youle. She is coauthor of two previous books – Life in Our Phage World and Coral Reefs in the Microbial Seas – and of more than a dozen research papers, many of which featured the phages. She also contributed over 40 phage-related posts to Elio Schaechter’s ASM-sponsored blog, Small Things Considered. She plans to continue writing about her beloved phages from her home on the Big Island. Next to come will be Phage in Community – her exploration of the thoughts of 1031 phages over evolutionary time and ecological space. Leah Pantéa is a classically trained artist who earned her BFA at Central Washington University and now specializes in drawing and painting. Her current mixed media abstract landscape work draws inspiration from the Abstract Expressionist movement. In recent years, she developed an additional, distinctive professional persona – illustrator of phage activities. 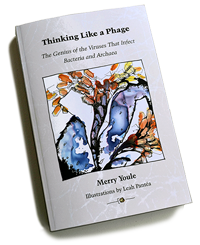 Her drawings for Life in Our Phage World (published in 2015) conveyed copious information in an informal, imaginative style. Her colorful drawings for Thinking Like a Phage range from chromosomes and thermodynamic principles to imaginative panels that convey the essence of each chapter. She lives and creates in San Diego. Alexis Morrison is a trade-shop graphic designer focused on typography and information design. She has applied her expertise to a wide range of projects including ads, forms, posters, packaging, books, directories, catalogs and more. Two books – Life in Our Phage World and, more recently, Thinking Like a Phage – have provided Alexis with the unique opportunity to showcase a complete array of design, technical and project management skills. Currently this multi-passionate artist and craftsperson sells a variety of products through her Etsy shop. She loves to spend all day creating tiny treasures in her cozy mountainside studio on the Big Island of Hawaii. Wholon is a hub that enables scientists and others to find collaborators for their various projects. From publishing art/science collaborative books and organizing conferences to data analysis and research paper editing, we facilitate the actualization of ideas. For more information about our books and projects, please go to www.wholon.org.